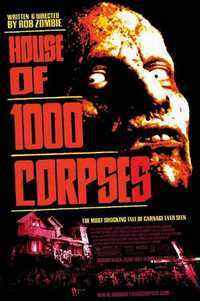 House of 1000 Corpses is a 2003 American exploitation horror film written, co-scored and directed by Rob Zombie in his directorial debut. The film stars Sid Haig, Bill Moseley, Sheri Moon, and Karen Black as members of the Firefly family. Set on Halloween, the film sees the Firefly family torturing and mutilating a group of teenagers who are traveling across the country writing a book. The film explores a number of genres, and features elements of the supernatural. Zombie cited American horror films The Texas Chain Saw Massacre (1974) and The Hills Have Eyes (1977) as influences on House of 1000 Corpses, as well as other films released during the 1970s. Initially filmed in 2000, House of 1000 Corpses was purchased by Universal Pictures, thus a large portion of it was filmed on the Universal Studios backlots. The film was made with a budget of $7 million. Zombie worked with Scott Humphrey on the score of the film. House of 1000 Corpses featured a graphic amount of blood and gore, and controversial scenes involving masturbation and necrophilia. The project was ultimately shelved by the company prior to its release due to fears of an NC-17 rating. Zombie later managed to re-purchase the rights to the work, eventually selling it to Lions Gate Entertainment. The film received a theatrical release on April 11, 2003, nearly three years after filming had concluded. This webpage uses material from the Wikipedia article "House_of_1000_Corpses" and is licensed under the GNU Free Documentation License. Reality TV World is not responsible for any errors or omissions the Wikipedia article may contain.